A seriously angry Lisa tells Danny that Sandy hasn’t been paying the insurance payments, so they can’t claim insurance from the fire. Danny appears to be defending Sandy, but Lisa storms in on Kath and Sandy and gives Sandy a piece of her mind. She says that she’s lost photographs, rings, letters that are of personal value, let alone her stereo and clothes. Lisa tells her she never liked her and she’d always thought she was an idiot. Ric and Tom are arguing because TCG has arranged for some big hospital bosses to observe an operation. Ric thinks that while if successful it would be fine, he thinks it’s highrisk and that the exercise could backfire. Ric cleverly says that he’s not prepared for his theatre to become a circus, with TCG as the ringmaster! Tom’s preparing for the op at home and listening to some music, when his windows are smashed and three men charge in. What seems to be a normal break-in appears more sinister, when Tom’s brother Martin is in the crowd. The order him to operate on a dying friend (and boyfriend to one of the men) but Tom isn’t as keen – he doesn’t have the equipment. One of the men punches him, and he reluctantly gives in. There’s no sign of Tom, but Ric wants to start anyway. Tom phones Sandy, who is bickering with Danny, and asks her to page Ed. Ed runs off to look after Tom, while Diane says he should stay and think about his career. Kath, who has been refusing Terry’s advances, finds a note on the microwave telling her to head up to the roof. She does so, and Terry’s dressed in a smart suit with a romantic meal and roses. He tells her that he loves her and that’s why he came back and left Sheila. She says that he doesnt love her, he’s just scared and that he doesn’t know what he wants. Tom starts the operation using kitchen appliances, and Ed is spotted by one of the men and is forced to assist. On Darwin, things aren’t running as smoothly as hoped and Ric is concerned about the surgicial ability of TCG’s replacement. He asks to set in, despite having not much cardiothoracic experience and to his and Diane’s joy, finishes successfully. In the lift on the way up to Darwin, Ed is having a go at Tom. He says that Tom just couldn’t resist showing off to Martin. Ed probably steps out of line by saying that Martin can play him, and that he always will, and Tom needs to smarten up. He reminds Tom that if anyone finds out about their illegeal operation then both of their careers are at stake. Lisa runs after Sandy and apologises for what she said. She says that £50 a week should be alright, but Sandy says that that’s half her salary! Lisa then says that the other half should go to Danny! Luckily, Lisa runs into her dad who gives her money and offers her a bed. Mubbs refused to put Lisa up, perhaps he’s playing hard to get? Terry meets Kath who says that she was hurt when he went back to Sheila, showing that he means something to her and she feelings something for him. She says that she wants him to be there for her, and the pair share a sweet kiss. -William Marshall, a 58-year-old former heavy smoker, is taken into surgery to remove an aneurysm. There is some trouble when Tom does not appear to do his part of the surgery and the other surgeon makes a mess out of it, but Ric decides to give it a try and manages to save the patient. – Nicola Basham is diabetic who giving birth to her fourth child, but her new husband does not seem to be too sure if he wants to be involved. Everything goes fine until the baby’s shoulders get stuck, but they eventually get the baby delivered. 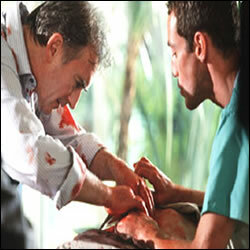 – Johnjo Kinsella, Martin’s friend with an internal bleed, Tom and Ed are operating on him in Tom’s house after being forced to do it. Lisa: I’ve got the letter, Danny! Danny: You can’t just… There’s probably an explanation! Lisa: Reasonable? We weren’t insured! It says so there! Kath: I was trying to call but there was no answer. Terry: I’m not at home. Kath: I was hurt when you went back to Sheila. But if I was hurt it must mean that I feel something. I don’t want to end up regretting the time we never had and I don’t want you to do a big number, all the stuff on the roof. It’s just… I want you to be there for me. Terry: That’s all I’ve ever wanted. That’s all I’ll ever do.